why join the mvhc ? 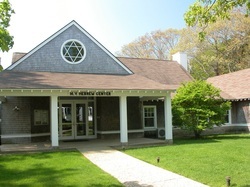 Welcome to the Martha's Vineyard Hebrew Center. We are delighted you are interested in our our growing community. The Center was founded in May of 1940 and is affiliated with the Union for Reform Judaism, the national organization for the Reform Movement. As the only Jewish organization on Martha's Vineyard, we welcome all Jews and their families to become members. Our very diverse congregation is made up of summer residents as well as people who live on the island year-round. We offer a number of spiritual, educational, cultural, social programs and experiences. We offer Shabbat and holiday services as well as religious learning. There is something for everyone. Please feel free to contact me, the office or any member of the board of trustees with questions you may have regarding membership. The Membership Committee has updated the private & confidential list of MVHC members on a password protected page on this website. Please call the office for your password. The day after Trump was sworn in I started asking folks where the best place to move would be. My friend Kathy said Portugal; no standing army beautiful weather and cheap. My friend Paula said Uruguay; gorgeous beaches, good people, no army. My friends in Ireland said come on over. This isn’t the first time I have researched leaving the country. Before Nixon got elected my husband and I vowed we would emigrate if he won. He won and we stayed. When Bush signed the Patriot Act I started my application to citizenship in Canada. When Barach re-upped the Patriot Act I was sure they were holding his children hostage. I went back to my bookmarked paperwork for the north of North America. As recently as a week ago Friday I was googling New Zealand real estate and looking at pictures of white sand and turquoise water. But everything changed that Saturday morning. My neighbor and friend Bill Gamson, had a Bar Mitzvah-----at 83!!! In his Torah portion, Moses faces the task of mobilizing the Jewish population to act collectively against an unjust authority… in that case Pharaoh. I was happy to be among the many guests at the Hebrew Center, but not being a regular in temple, I expected to duck out as soon as the service was over. I sat there remembering how much I had loved my own Bat Mitzvah but how little meaning Religious School in general had been. We learned Hebrew by rote, the Rabbi talked only to the rich kids, (which meant he didn’t talk to me) and the sermons were long and boring . My parents were cultural Jews. Assimilation was the name of the game. We celebrated only the high holidays and Passover. Hanukah was a joke, a pale competitor of Christmas. The biggest compliment you could hope tp get was “You don’t look Jewish”. I have had a love hate relationship with my Judaism. The things I have treasured about being Jewish are Tikkun Olam (repair of the world) knowing that as a people we are committed to the responsibility of helping to heal the brokenness of the world. There are many rituals I respect like at Seder, putting bitter herbs on top of the sweet Charosis (apples wine and walnuts) signifying you cant be completely happy until EVERYONE (not just Jews) is free. I love our humor. I love our food. I love the fact that we can argue with God. I love that we argue among ourselves, heated passionate disagreements. I love the search for knowledge and the thirst for intellectual challenges. But I don’t like what Israel is doing. I don’t like organized religion that claims God as their own, and I don’t like thinking of us as The Chosen People. But on Saturday my ambivalence turned to pure love when Rabbi Rachel Cowan got up and reminded me what a miracle the light of day is. It’s hard to write the sound of her words so you get what I got sitting there. All I know is I go to sleep in a very dark room and when morning comes I walk out into the kitchen and it’s light. And I make coffee. Rachel reminded me that every day is a miracle. Every day the sun comes up. Why don’t we realize that that’s a miracle???!!!! Rabbi Caryn Broitman sang like an angel . The discussion among the congregation about what to do in this critical time in our nation was like being in a graduate course; Social Justice (and the Jewish question) (that Jewish Question part is an in- joke). I looked around and there was my pharmacist. And there were Vicky and Armen Hanjian, Methodist ministers, early, early friends whom I met the first year I came to the island and Sally Cohn, who the minute I see her silver hair, so like my own, my heart is happy . And there was Euell Hopkins my precious friend, Kimberly’s husband, and there were Bob and Bonnie George, and Harriet Bernstein glowing in white and Barney Zeitz (whose gorgeous windows grace the center) and Phyllis Vecchia and my friend Jill Bernstein and Ljuba and Rhoda Diamond, who I love driving to a few of her millions of events and of course Zee who had arranged the whole thing. And Lynn Ditchfield, an astounding human being and my old boss at ACE, and Nancy and Duncan and Max Jasney and Marjory Potts who taught us how to use our video camera and Nicole Brisson, the writer and her brilliant chef husband and Avi, who has been such a mensch in all our lives, and and…. Maybe because I stood for the Mourners’ Kaddish (the prayer for the dead) and I spoke my son Dan (who died 7 years ago) name out loud , maybe subconsciously I never really wanted to leave my country, or maybe all this time I have just been looking for my tribe. But I couldn’t duck out. I stayed for the delicious lunch and for the beautiful toasts to Bill. And when I got home instead of emailing my application for citizenship to Canada, I closed my computer with the photographs of all the places I will probably never see. And I sat down and wrote the check for my membership to the Martha’ s Vineyard (all inclusive) Hebrew Center.